« The upside of downtime. Boldly trying yet another new hobby. Honestly, pretty much the last thing I needed was an additional claim on my time and money. 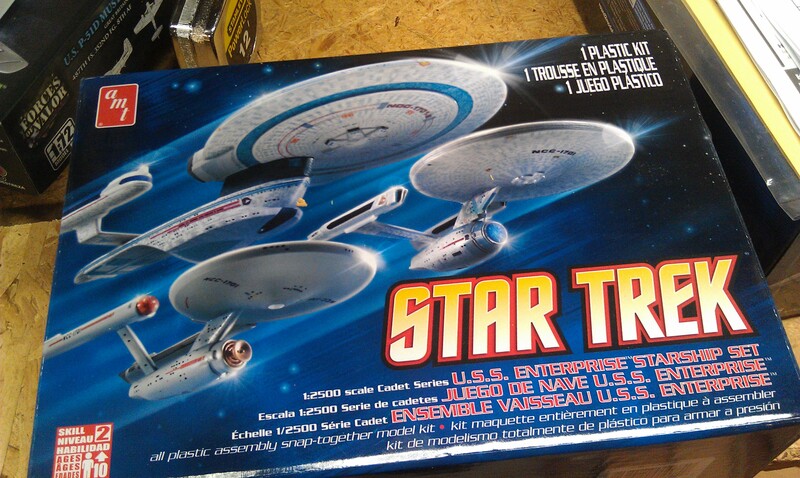 Yet I’ve somehow found myself waist deep in plastic model kits for Star Trek ships. It began innocently enough, a few weeks ago I saw on Twitter that StarTrek.com was having a sale. I’d been wanting to pick up a t-shirt or two and figured I’d see what else they had. 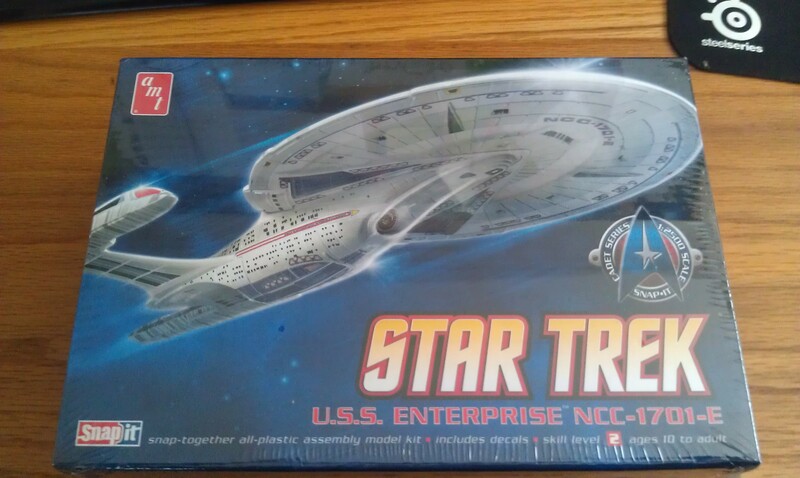 When I found the models page and saw that the Enterprise E was on sale, I ordered one. The last model I put together was a General Lee when I was ten, so I’m way out of practice. The listing said no glue or paint required though and I figured it would be no problem. Fast forward a bit and I got the model, assembled it and started looking over the decal directions. This is when I realized two things. 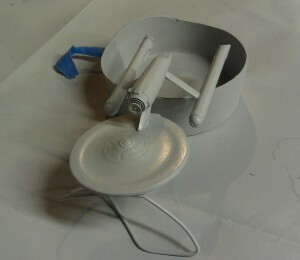 First there was no decal for the impulse engines at the back of the saucer. Second there were an awful lot of decals. It turns out that there is some painting needed if you want the model to match the picture on the box, and I really wanted it to match. That weekend I took my son and made a trip to the local hobby shop to look around at the paints and see if they had any cheap model kits for me to practice on. 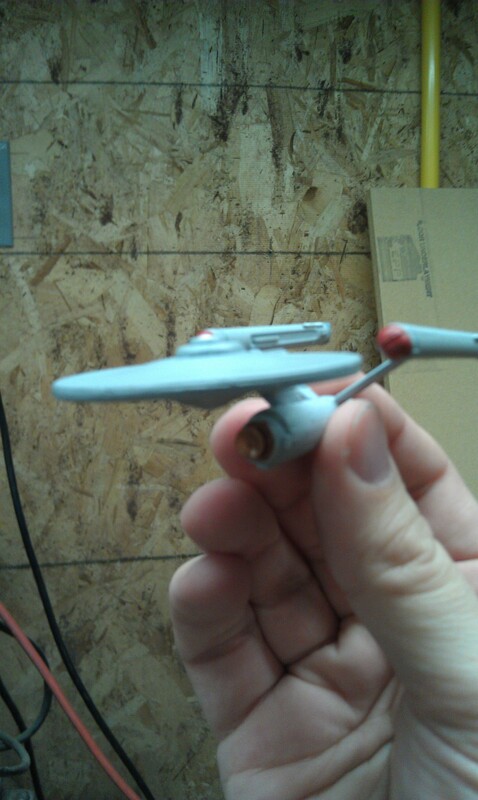 I figured I needed to work up to a Sovereign-class ship. I ended up finding the perfect thing too. 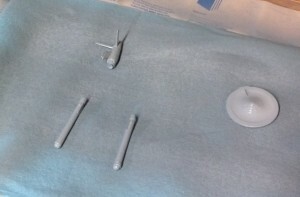 Not only was this kit inexpensive, but it had three tiny ships to practice on. Plus, neither the original Constitution nor the Excelsior are ships I especially like, so if I screwed them up badly I wouldn’t feel bad about throwing them out. Over the last few evenings, I’ve learn quite a bit about what order to do things in, or more specifically what order not to do things in, and how to correct mistakes. Well mostly correct them. 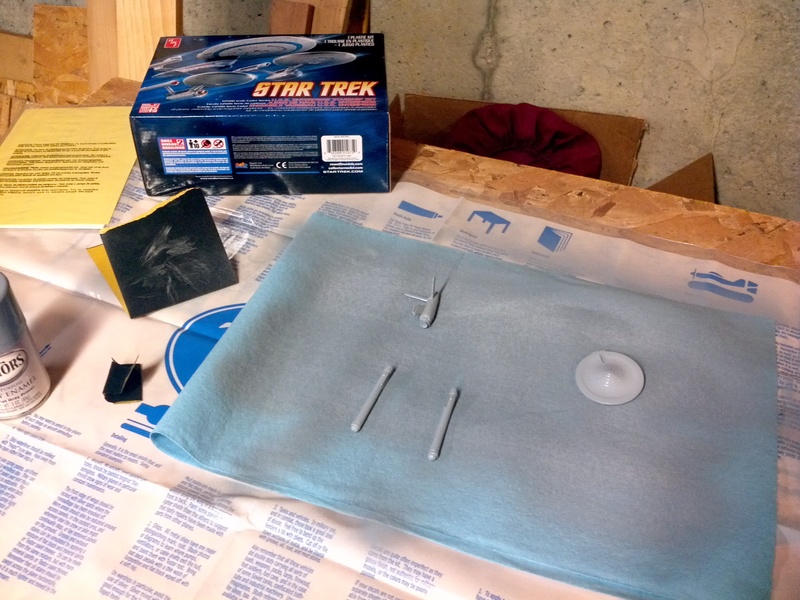 Stupidly, I laid out my Original Series model on a shop towel and laid down the paint way too heavily. Not a good idea. 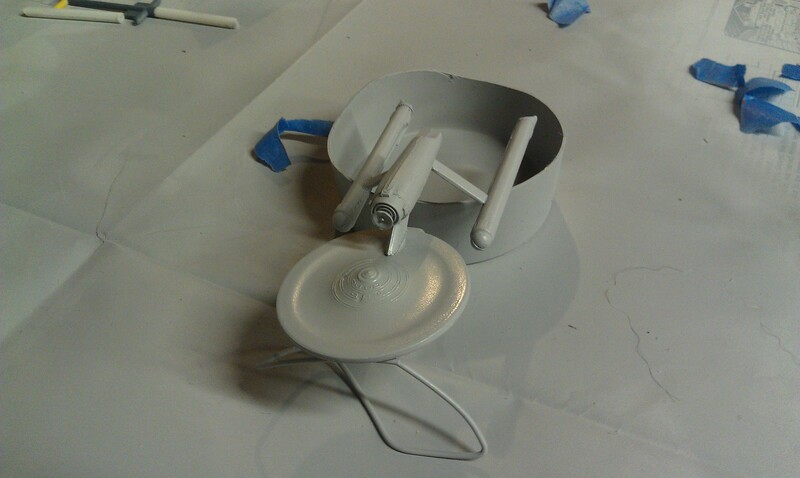 I ended up with a real mess had to strip off all of the paint, breaking the nacelles, dish, and struts off in the process. 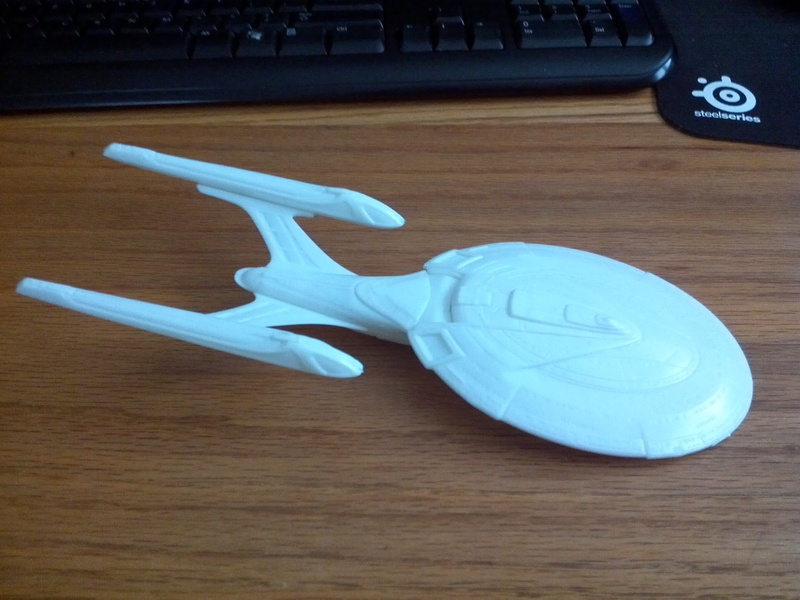 I managed to get the pieces up and glued everything back together, but the nacelles are a bit crooked and I don’t see a way to fix it. Despite the issues I had, it didn’t turn out too awful and I think the detail painting I did turned out pretty well. 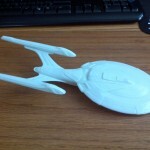 She'll break apart at warp speed. She’s not done yet though, I still need to add the decals which will be an entirely new learning curve to tackle. Neat! I used to build a lot of mech models when I was a kid, I kind of miss it.